Retail financial institutions must develop a strategic link between digital channels and their ability to support customer experiences that result in sales. Today’s consumers are tech-savvy, connected 24/7, social and impatient. If banks are not providing a service on a par with the likes of Google, Uber or Amazon, people feel a palpable sense of disappointment. 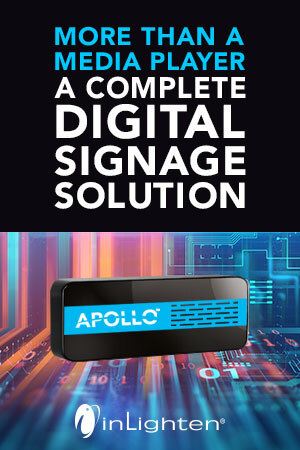 And yet many institutions remain poorly equipped to leverage a digital experience that drives sales and forges stronger customer relationships. This is the finding from a research study from Misys and the European Financial Management Association (Efma), who jointly set out to explore the relationship between customer service, sales and digital channels. The results paint a grim picture. One in five banks today perform less than 1% of their sales via digital channels, while 40% of customer acquisition is still done through the branch. “Customer centricity” as a concept is nothing new. For more than two decades, banks and credit unions have lauded the benefits of putting people first. Indeed no institution would claim anything other than placing customers at the heart of their business model. 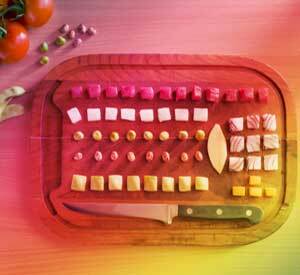 However, Misys says all this talk about customer centricity is little more than lip service. In the study, 75% of banks confessed they have not concentrated efforts on improving their customer experience, but instead have remained focused on sales-specific activities. 48% of banks think the term “customer centricity” is overused. In fact, 48% of respondents think the term “customer centricity” is overused. Misys argues that they became fatigued by the term long before they could have justifiably achieved a customer-centric approach — a paradox with serious consequences. The increasing penetration of digital devices globally — in industries beyond banking — is putting pressure on financial institutions to reengineer their infrastructure around digital. However, banks and credit unions have still not shifted enough out of the branch and into digital. In spite of big developments in digital infrastructure and two decades of bank investment in this area, Misys research shows that digital banking services still have yet to fulfill their promise. One in five banks performs less than one percent of sales via digital channels, and 87% of banks perform less than 10% of sales via digital. 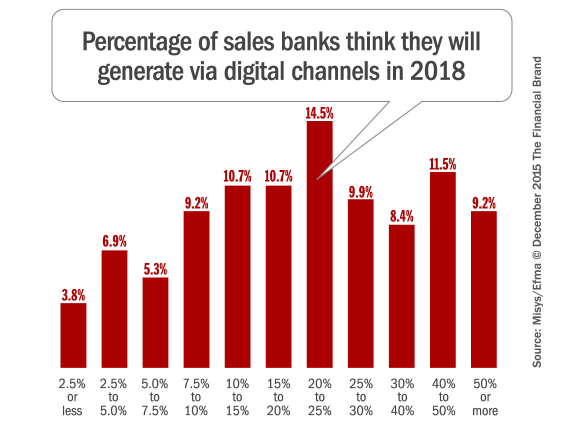 Only 12% of banks state that digital channels are the greatest source of customer acquisition, while 41% of banks still place the branch as the top source. Word of mouth and advertising still perform strongly for banks when it comes to generating new customer relationships, indicating that the power of reputation remains strong in retail banking. The harsh reality? Digital channels are not supporting sales. Sales have yet to migrate out of the branch. If consumers were using digital channels effectively, they would be buying more products and services. The fact that few sales are conducted via digital could infer that consumers’ needs are not being met. Many banks have yet to benefit from proactive, predictive selling leveraged in other industries. But the current picture is predicted to change dramatically in the next three years. 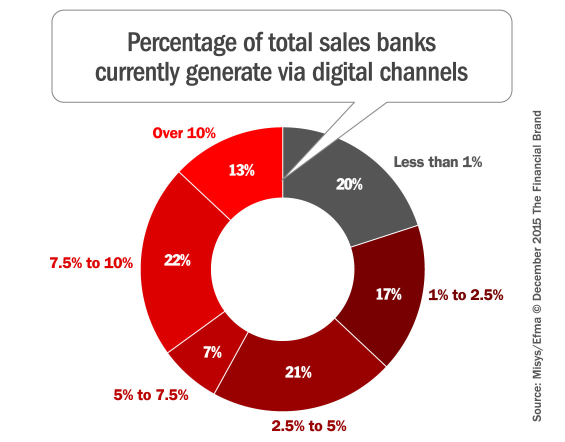 The number of banks performing more than 10% of sales via digital channels is forecast to jump from 13% today to 75% in three years. In fact, more than a third of respondents think that only one-quarter of sales will continue to come through traditional channels by 2018. Misys says the digital imperative is clear — retail financial institutions need to adopt an omni-channel approach, improve customer engagement and understand each customer’s specific needs. With more institutions now measuring customer relationship successes as opposed to traditional sales goals, core systems must be able to deliver the relevant insights and analytics that highlight successes and opportunities. 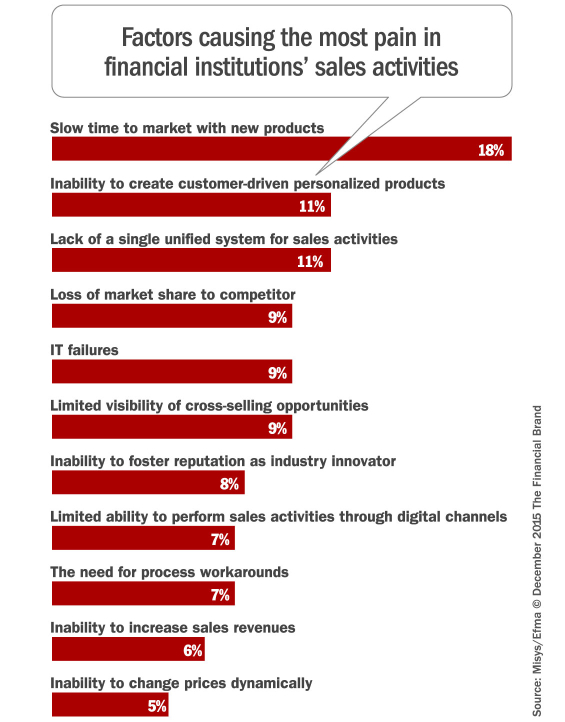 Slow time-to-market with new products and services is clearly one of the biggest pain points when it comes to technology challenges that impact sales teams, with 18% of banks rating this as their single most agonizing technological issue. In the Misys research, one in ten banks said they have been frustrated by an inability to create customer-driven personal products and services. The vast majority, for instance, cannot support event-based real-time marketing where messages are tailored to the customer. 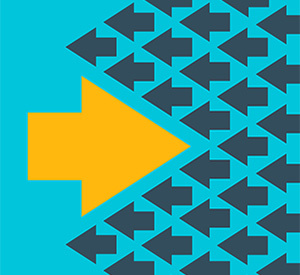 CRM and predictive analytics drive real-time marketing success, yet nearly half of all institutions say they struggle in this area, while 11% of banks cite lack of a unified system for sales activities as a top frustration. This is an acute problem preventing banks from truly linking sales and customer service. Barriers to CRM and predictive analytics must be overcome. Banks that can understand customers better can identify where they can increase profitability for each of their products and services in a relevant, tailored way. Misys says the role of digital channels to improve the targeting of marketing offers is crucial. For example, banks can use location-based campaigns and merchant-funded offers delivered on mobile devices. Personal financial management applications can also be very helpful in providing valuable customer insight that can be utilized to personalize and target sales and marketing campaigns. With valuable insight into the financial aspirations and behaviors of their customers, Misys says banks and credit unions can achieve a rounded view of the customer across every channel and can deliver product offerings right at the point of customer need. Far from being able to emulate Google and Amazon, banks are currently unable to innovate despite a strong desire to do so. But don’t despair. Misys says it is entirely possible to build a customer-focused institution, built on core software and systems that can deliver better customer experiences as well as increase sales, all via an omni-channel approach. The difficulty lies in the challenging journey to upgrade legacy systems and overcome historical barriers to digital adoption. Technology advances and consumer attitudes make it feasible that digital channels will become the primary source of banks’ sales. But the question is: “Will banks meet their own forecast and deliver by 2018?” Now is the time to close the gap between hype and reality. You can download the entire 32-page report, “Sales or Customer Focused: Banks’ Evolution to Customer-Driven Sales,” for free directly from the Misys website after completing a short contact form. Click here — the report is solid gold. This article was originally published on December 1, 2015 . All content © 2019 by The Financial Brand and may not be reproduced by any means without permission.